Fairbrother Geotechnical Engineering offers a range of solutions for lateral support. We offer design and construct services as well as contsruct only services for those projects that have been designed by the client. This solution is typically used to support basement excavations or existing unstable slopes and provides for an in-situ solution of reinforced earth. The soil nails are drilled on a close grid and this allows for the soil mass to act as a homogenous unit. The grid of nails is then bound together with a layer of reinforced shotcrete. This technique can be offered as either a temporary or permanent solution and is very economical to install in the right circumstances. A very cost effective solution to slope stabilisation and basement excavation. Suited to any shape of excavation and can easily accommodate multiple benches. Equipment is small and lightweight..
Not suited to basement excavations that have large surcharge loads close to the excavation. Not suited to excavations below the water table. The tensioned anchor is used most commonly for lateral support to deep excavations with high surcharge loads and is often incorporated into piled retaining walls. The tension anchor can also be used to tie back large structures spanning deep seated failures and to resist uplift forces. The tensioned anchor can be offered as either a temporary solution or as a permanent anchor with a lifespan of up to 120 years. It can be used in almost any ground conditions if effective pressure grouting procedures are followed. The tensioning of the anchor limits ground movements in basements and can be adapted to accommodate the surcharge loads. Can be used to support deep seated failures. Can be designed for a 120 year lifespan. Long term anchors need to be checked regularly during its working life. The concrete soldier pile is also used for lateral support systems. It can be used to create either as a cantilever wall or can be tied back using anchors or can be braced... The soldier pile can also be used to carry the vertical load of a building structure and is normally incorporated into the new structure as permanent works. The piles can be used to carry vertical loads. The wall can be incorporated into the permanent structure. Corrosion protection is not required. The system is very adaptable and can accommodate almost any conditions. The system can encroach on permanent works. This system is generally used in sandy horizons below the water table and is often used as temporary works for trenches or pits. 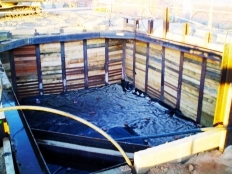 Pits can be constructed to depths of 8m in sands and provide for a very safe and effective temporary lateral support. The pits are constructed by first driving the soldier piles in and around the perimeter of the pit with a piling rig. A horizontal whaler is then welded around the inside of the soldier piles joining all of the piles together. Excavation of the pit commences and 6m x 3m Timber panels are cut and fitted between each soldier pile and then pushed down as the ground is removed from the inside of the pit. Whalers are placed between 2.5m to 3m intervals horizontally as the excavation proceeds. This method is repeated until final depth is reached. This method is quick and does not require sophisticated equipment to construct the pit. It is ideally suited for pits in soft sands. Some of the material can be reused. 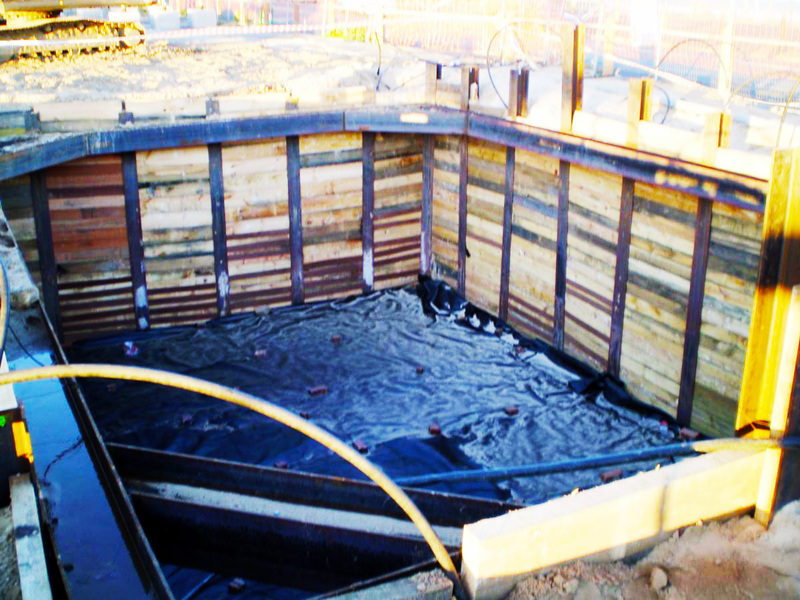 If there is a high water table then dewatering must be done before the excavation proceeds. Not suited to lateral support that has surrounding infrastructure in close proximity to the pit as settlement does occur during construction.